Pocket diapers are made of an inner layer, usually microfleece or suedecloth, which wicks moisture away, and a waterproof outer layer. You stuff the diapers with an absorbent insert through an opening in the front or back of the diaper. Usually, the inserts come with the diapers, but you can also use microfiber towels or folded up prefolds as inserts. Some popular pocket diapers are FuzziBunz and Happy Heinys. All-in-Ones (AIOs) are just what their name implies. Everything is built together into one easy-to-use diaper. The inner, outer, and absorbent layers are all sewn together so there are no pockets to stuff or extra covers needed. These make great diapers for daycares or for other caregivers who are nervous about using cloth. Some AIOs feature a pocket to add extra inserts, which is wonderful for heavy wetters. A drawback to AIOs is that they take longer to dry then other types of cloth diapers. BumGenius makes popular AIO diapers. All-in-Twos (AI2s)/Hybrid Diapers are very similar to AIOs, except the absorbent insert snaps to the outer shell of the diapers. Many times, the outer shell can be reused throughout the day by just changing the insert. Some popular AI2/Hybrid Diapers are GroBabys (GroVias) and Flip diapers. Fitteds look a lot like AIOs, but do not have a waterproof outer layer so they usually need to be used with some type of cover. Many fitteds are made so that your baby can go coverless for short amounts of time. This is especially helpful if your child has a diaper rash because it allows air circulation while still providing some type of coverage. Some popular fitted diapers are Thirsties Fab Fitteds and Kissaluvs. Prefolds/Flats are usually made out of birdseye material. 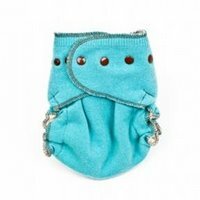 These diapers do need a cover and usually require some type of fastener like a Snappi or diaper pins. Flats are large rectangles of material that are folded and pinned or snappied on your baby. These are the diapers that many of our grandmothers might have used. Prefolds are kind of a step up from flats. They are usually made of the same material, but have multiple layers sewn together with extra layers in the middle. 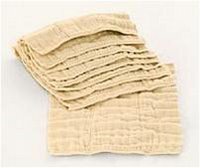 Prefolds or flats with covers offer a very inexpensive way to start cloth diapering. Covers can be found in a few different materials. PUL diaper covers are made of the same type of material used in the waterproof outer layers of Pockets, AIOs and AI2s. PUL diaper covers are nice because they can be wiped down and reused again before washing. Fleece and wool diaper covers provide a breathable cover option. These types of covers are water resistant and, when paired with fitteds, are a great solution if your child is prone to diaper rash. Since we’ve made the switch to fitteds and wool or fleece covers at night, we’ve had little problems with diaper rash. Thirsties Duo Wraps and Nifty Nappy Woolie Wraps are a couple popular cover options. Unless you have a cloth diaper store in your area or know of someone who uses cloth, it can be really hard to judge what type of diapers will work best for you. Thankfully, many online stores now offer trial packs that feature a variety of diapers. Most stores allow you to use the trial pack for 10-20 days and then return the diapers that you don’t like for a refund. We got our trial pack from Jillian’s Drawers and actually ended up keeping all of the diapers. If you’re handy with a sewing machine, you can save costs by making your own diapers. 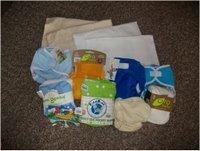 There are many free diaper patterns out there, and you can buy diaper making supplies online from places like Wazoodle.com and Fabric.com. I recently started making our own fleece covers and it’s a lot easier than I thought it would be. 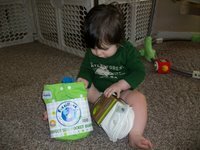 Another money saver is to check out sites like DiaperSwappers.com for gently used diapers. Some online cloth diaper stores also have a gently used or previously loved section. Don’t worry if you can’t get your whole supply at once. The great thing about cloth diapering is that it doesn’t have to be all or nothing. You can start out small and just add more diapers when you can. Photos credit: author, unless otherwise noted. Tara is a work-at-home mom to 18-month-old Colton. She blogs at Cloth Chronicles where she writes about cloth diapering and motherhood with some product reviews and randomness thrown in. She also started I Heart Fluff on Facebook to keep fellow fluff addicts up to date on all things cloth! Tara and her Husband own and manage their farm where they raise grain, cattle, and a few fainting goats! Just to add a little bit more craziness, Tara also owns a small natural parenting store. Great post, Tara! Very much to the point 🙂 I will definitely link any mama friends thinking of making the switch to this in the future. I love this! My son is almost a year and we’ve just started slowly making the switch. This kind of article is perfect for people getting started and learning the lingo. So far I’ve found actually using the diapers and doing the laundry much easier than I expected. I think the toughest part is knowing what all stuff you need to get started — diaper pail, wet bag, special laundry soap, cloth wipes, wipe solution, etc. I’ve tried Flips and Fuzzibunz with great success, but I’m excited to try some prefolds and covers soon. Thanks Melissa & Emilly! I had such a problem deciding which type of CD would work best for us so I hope this makes it a little easier for new CDing families.